Essie Fishnet Stockings is a staple red for anyone's collection. It came out in the 90's and hasn't lost it's appeal or gone out of style. I remember reading in a fashion magazine a couple years ago, that everyone needed to own this spicy dark red creme so when I came across it at the drugstore, I listened and bought it for myself. 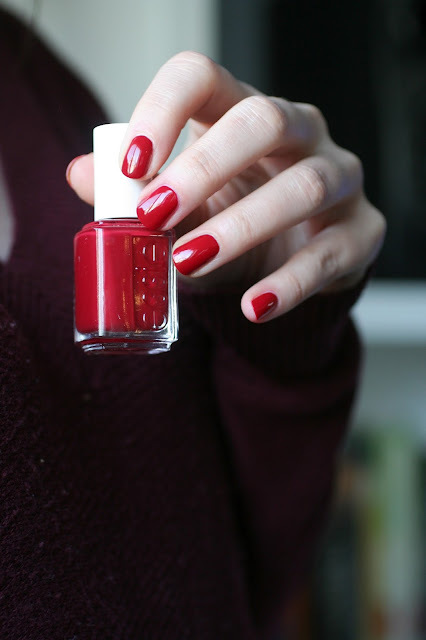 I really love this red in winter. It's a true-red with very slight blue undertones. The formula is fantastic. Buttery smooth and perfect in 2 coats. Fishnet Stockings vs Shall We Chalet? 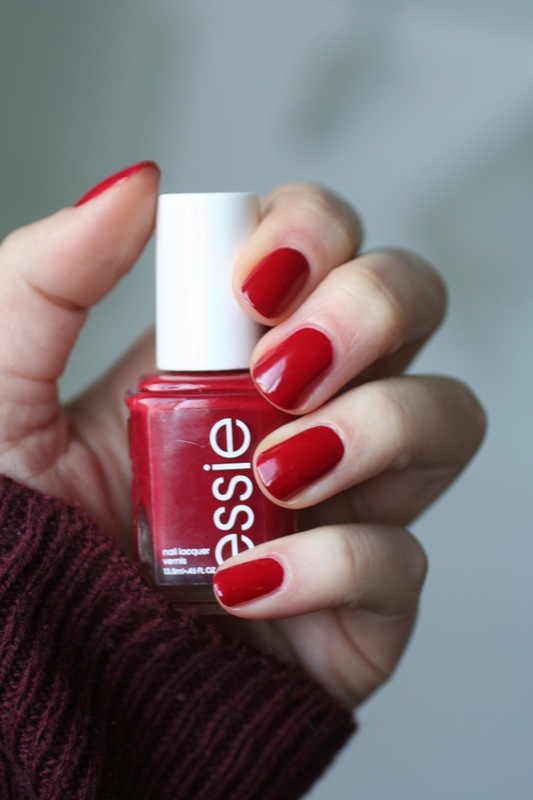 Essie must've loved this red for winter as well because they went and duped themselves with Shall We Chalet from the 2015 Winter Collection. I'm wearing both polishes below. Can you tell them apart? The bottle shot makes Fishnet Stockings seem like it will be darker than Shall We Chalet but 2 coats on the nail and they are identical. Both have a fantastic formula so if you are in need of a good winter red staple I recommend picking up one of them! While both are great (and identical) there's something about Fishnet Stockings being the original and the true "classic" that appeals to me. It's been in the permanent collection since it came out so it should be incredibly easy to find anywhere. Do you own this classic Essie polish? I have Shall We Chalet and I love it, but it stains my nails even with a base coat. Is Fishnet Stockings any better? I haven't experienced any staining with Fishnet Stockings Alison. 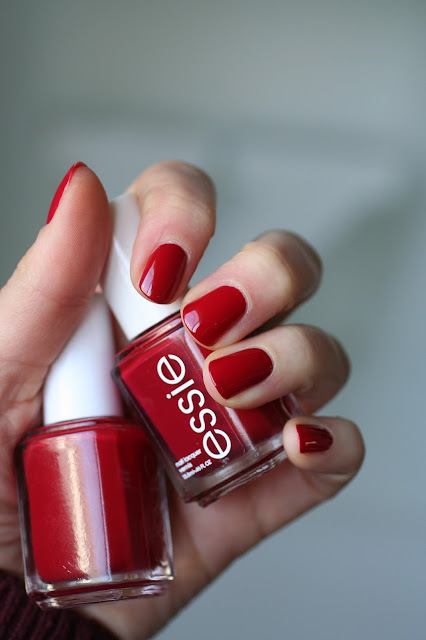 I have Shall We Chalet in mini format, from Essie's mini winter set. I have yet to put it on though, so I don't know if I'll end up with staining like Alison. 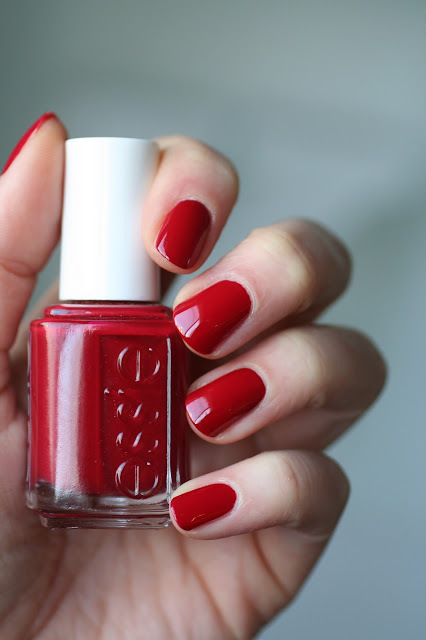 But usually my nails are pretty good at never staining, I use Essie's Grow Stronger as a base coat if that's any help Alison? But I have yet to try it, so I don't really know?! I just got my nail mail at noon today and I had Fishnet Stockings in my order. I love how it looks in the bottle but before I test it out I'm painting my nails one colour from the Essie 2016 Spring line I also ordered. (Not sure which one yet).